Share your thoughts why x can kick y anytime of the day..
Re: Gandy's Rockstar Deathmatch #2: John Mayer Vs. Joe Bonamassa VOTE NOW! a bit tough...but, Im gonna have to go John Mayer...for his sweet strat sound..
John mayer ako! Mas trip ko boses and clean tone ng strat niya! kahit na "malambot" pa sakin si John Mayer eh, vote ako sa kanya! ahahha di ko masyado trip ang dating at tugtog ni joe.. I'll go for john mayer.. parehas silang magaling pero mas swak sa panlasa ko si JM. John Mayer -- has hot chicks. After all, that's why we play, right?? nakita nyo ba yung vids nung bata pa si Joe!?! hahaha para siyang ""the fat kid"..sa mga movies.. They are both great bluesmen, but with different flavour. I dig, john mayer, may lambing kasi bawat blues licks niya in his every blues song. same sentiments about that lambing...i sensed that too..
John Mayer. I like how he can stop playing and you can still feel it. My Thoughts exactly. John Mayer here. Siya yung nagintroduce ng blues world sakin eh. HAHAHA tska yung Tone niya eh. there's something about his strat tone that makes your ears want to keep on listening sa solos niya. Sarap lang sa tenga. This should be a no contest. Joe Bonamassa. I get Mayer's "appeal" even for the dudes (or maybe "envy" is the better word) and he's not a bad blues player, but that's it. Nothing special about him or his playing. 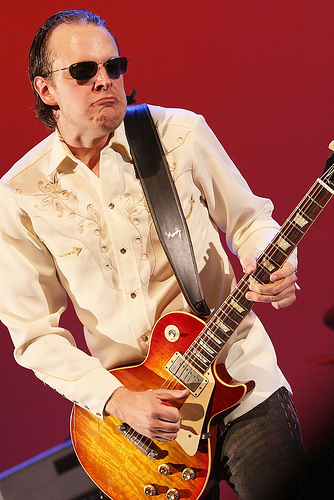 Joe Bonamassa reminds me of Gary Moore. He can play the blues just as well as anybody and shred with the best of them. Joe Bonamassa.. because of his Les Pauls. Kidding..
Sobrang gusto ko lang ang blues rock na peg ni Joe Bonamassa. haha. I vote for JM, for me mas swabe at soulful yung licks nya at overall writing. He doesn't need to play fast licks to get your attention. Bad Behavior has blocked 83483 access attempts in the last 7 days.